Remember when you were a kid and friendship bracelets were all the rage? Annie recently dug out her kit that uses hemp and beads and has been “knotting” up a storm. Then, I stumbled upon this post at Lil Blue Boo via Craft Gossip. Since I have multitudes of t-shirt scraps this was perfect! 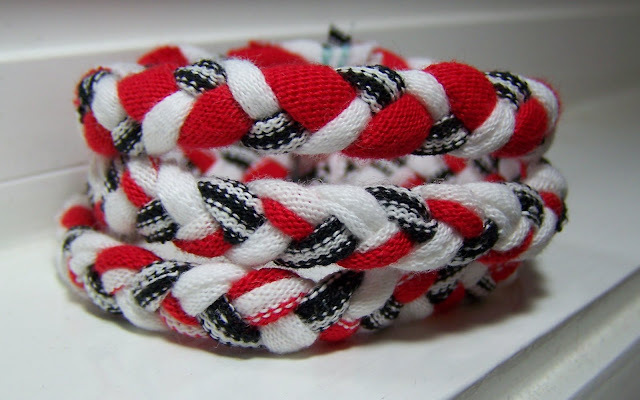 Even my 10 year old son has enjoyed braiding these and is now supplying his classmates with bracelets in patriotic and favorite school colors. 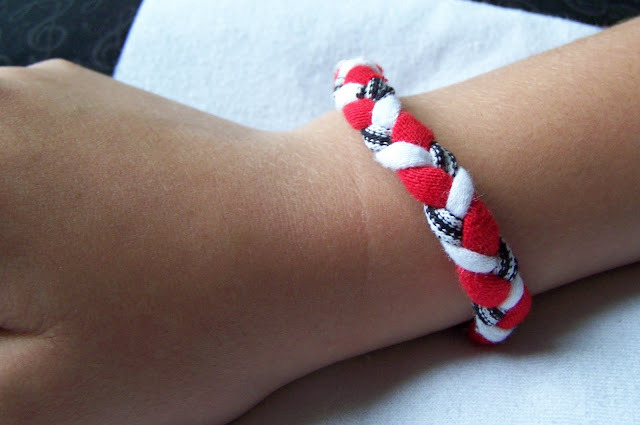 Love it, my 11 year old daughter is standing here, she is the bracelet maker and wants to make them too! Thank you Jane!! I think I spent the majority of my childhood making friendship bracelets. You know what else is back – jelly bracelets – and the boys are wearing them, too! Nothing new under the sun. Love those t-shirt bracelets! Very cool. I guess I’m too old for the friendship bracelet craze because I never made one, but I do remember making necklaces out of folded up chewing gum wrappers. I wonder if kids still do that. Great idea, those are cute. Sadly, I don’t think my boys would be into friendship bracelets 😉 I don’t have a single niece, either. Sheesh… girls are so much easier to craft for! Very cute! What a great idea – and extra great for you with all your quilting scraps!